The SCE-ELSSLPPL Series of electrical enclosures are designed to house electrical and electronic controls, instruments and equipment in areas which may be regularly hosed down or are in very wet conditions. 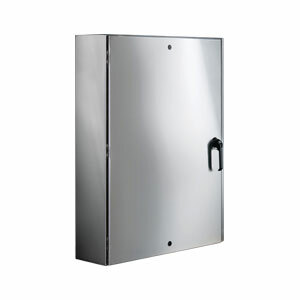 These stainless steel electrical cabinets provide protection from dust, dirt, oil and strong jets of water. This outdoor electrical control panel is the solution for weatherproof applications. Note: For outdoor applications a drip shield is recommended. Models below must ship LTL Freight - Additional shipping charges may apply. Note: Comes complete with mounting hardware, sealing washers and hole plugs.